NeuroD1 in beta TC-6 Mouse Cell Line. Neurogenic Differentiation factor 1 (NeuroD1) was detected in immersion fixed beta TC-6 mouse beta cell insulinoma cell line using Human/Mouse NeuroD1 Antigen Affinity-purified Polyclonal Antibody (Catalog # AF2746) at 10 ╡g/mL for 3 hours at room temperature. Cells were stained using the NorthernLightsÖ 557-conjugated Anti-Goat IgG Secondary Antibody (red; Catalog # NL001 ) and counterstained with DAPI (blue). View our protocol for Fluorescent ICC Staining of Cells on Coverslips . 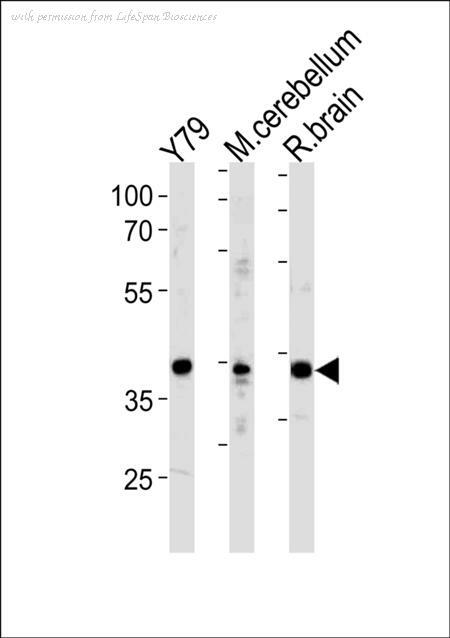 The NEUROD1 antibody from Proteintech is a rabbit polyclonal antibody to a recombinant protein of human NEUROD1. This antibody recognizes human,mouse,rat antigen. 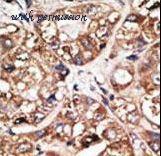 The NEUROD1 antibody has been validated for the following applications: ELISA, IHC, WB, IP analysis. NeuroD1 Antibody (I333) western blot of Y79 cell line ,mouse cerebellum and rat brain tissue lysates (35 ug/lane). 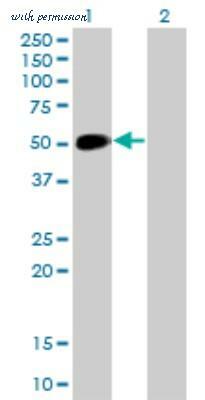 The NeuroD1 antibody detected the NeuroD1 protein (arrow). Western blot of hNeuroD1-Q30 in HepG2 cell line lysates (35 ug/lane). 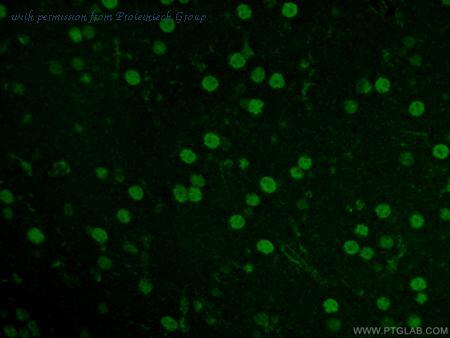 NEUROD1 (arrow) was detected using the purified antibody. Fluorescent confocal image of HepG2 cell stained with hNeuroD1-Q30. HepG2 cells were fixed with 4% PFA (20 min), permeabilized with Triton X-100 (0.1%, 10 min), then incubated with hNeuroD1-Q30 primary antibody (1:25, 1 h at 37°C). 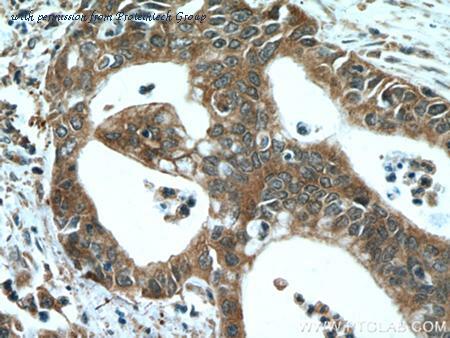 For secondary antibody, Alexa Fluor 488 conjugated donkey anti-rabbit antibody (green) was used (1:400, 50 min at 37°C). 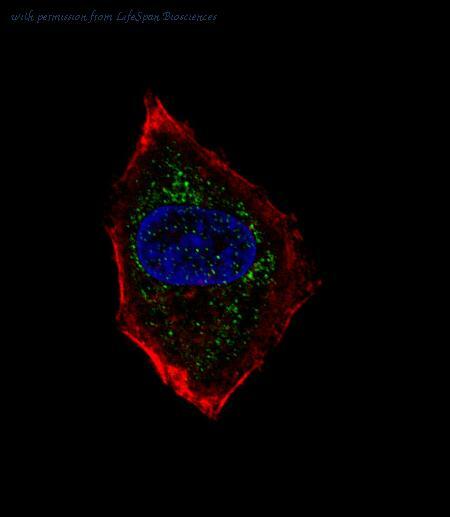 Cytoplasmic actin was counterstained with Alexa Fluor 555 (red) conjugated Phalloidin (7units/ml, 1 h at 37°C). 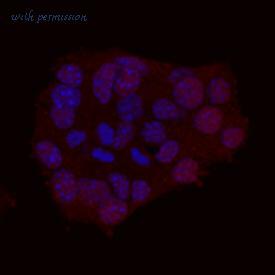 Nuclei were counterstained with DAPI (blue) (10 ug/ml, 10 min). hNeuroD1-Q30 immunoreactivity is localized to vesicles significantly. 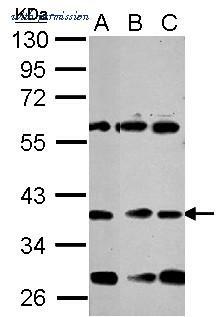 Western Blot: NeuroD1 Antibody (3H8) [H00004760-M01] - Analysis of NEUROD1 expression in transfected 293T cell line by NEUROD1 monoclonal antibody (M01), clone 3H8.Lane 1: NEUROD1 transfected lysate(39.9 KDa).Lane 2: Non-transfected lysate.